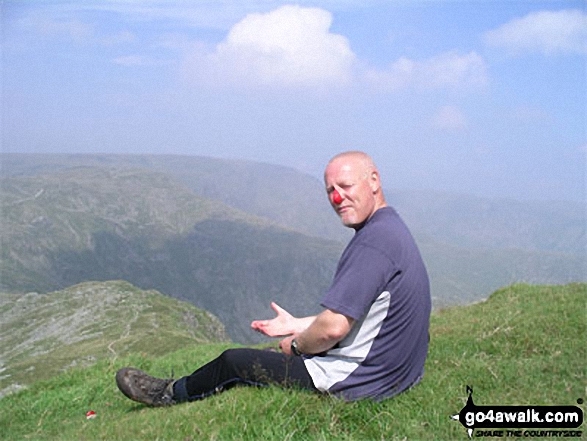 PK - The clown admiring the view on Harter Fell (Mardale) - looking over to High Street. Route Summary: - Stockdale, Sadgill Bridge, Stockdale Beck, Great Howe, Grey Crag, Tarn Crag (Sleddale), Sleddale Fell, Selside Brow, Branstree (Artlecrag Pike), Gatescarth Pass, Harter Fell (Mardale), Kentmere Pike, Goat Scar, Shipman Knotts, Wray Crag, Stockdale. Route Summary: - Kentmere, Garburn Pass, Yoke, Ill Bell, Froswick, Thornthwaite Crag, Mardale Ill Bell, Nan Bield Pass, Harter Fell (Mardale), Kentmere Pike, Brookstones, Kentmere. Route Summary: - Mardale Head, Haweswater Reservoir, The Rigg, Dudderwick, Swine Crag (Riggindale), Heron Crag (Riggindale), Eagle Crag (Riggindale), Rough Crag (Riggindale), Caspel Gate, Riggindale Crag, Long Stile, High Street, Mardale Ill Bell, Nan Bield Pass, Harter Fell (Mardale), Adam Seat, Gatescarth Pass, Mardale Head. Route Summary: - Mardale Head, Haweswater Reservoir, Rowantreethwaite Beck, Old Corpse Road, Selside Pike, Branstree (North East Top), Branstree (Artlecrag Pike), Gatescarth Pass, Adam Seat, Harter Fell (Mardale), Nan Bield Pass, Mardale Ill Bell, High Street, Riggindale Crag, Caspel Gate, Rough Crag (Riggindale), Eagle Crag (Riggindale), Heron Crag (Riggindale), Swine Crag (Riggindale), Dudderwick, The Rigg, Mardale Head. Route Summary: - Mardale Head, Haweswater, Rowantreethwaite Beck, Old Corpse Road, Selside Pike, Branstree (North East Top), Branstree (Artlecrag Pike), Gatescarth Pass, Adam Seat, Harter Fell (Mardale), Nan Bield Pass, Mardale Ill Bell, High Street, Riggindale, Rampsgill Head, Wainwright's Coast to Coast Walk, Kidsty Pike, Kidsty Howes, Bowderthaite Bridge, The Rigg, Mardale Head.